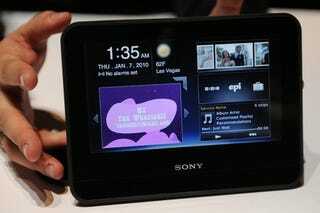 The device has a 7-inch touchscreen and provides access to over 1,500 apps from the Bravia Internet Video platform and from Chumby. Today Sony also announced that eHow, Golflink, and Livestrong.com will be providing content for the Dash, but the big news is the streaming of Netflix movies and TV shows. Just touch the Netflix icon on the display and you'll be taken to your Queue, from which you can select your content of choice. A Personal Internet Viewer ain't a tablet on the order of the iPad or Notion Ink Adam, but having Netflix on board does make the Dash an appealing content-delivery device—especially for its $200 price tag. SAN DIEGO, Feb. 16 /PRNewswire/ — Sony today announced that its new dash™ personal Internet viewer will feature a dedicated application for Netflix, allowing Netflix members to instantly watch thousands of movies and TV episodes directly on the unit. Additionally, Demand Media, Inc. has confirmed that its service offerings, eHow, Golflink and LIVESTRONG.COM will be added to the expanding content lineup. Sony's dash personal Internet viewer wirelessly delivers the real-time Internet to any room of the home or office by providing always on, sequential display of over 1,500 apps from Sony's Bravia™ Internet Video platform and the chumby industries, inc. personalized content channel. Further, the new dash device has the ability to stream online music videos, television, or film content on-demand. It features a vivid 7-inch color touch screen and multiple viewing angles: upright, ideal for a table or nightstand; and tilted, perfect for a countertop, keeping its users connected, informed, and entertained without the need for a PC. "We're continuing to develop innovative products that bring online music, news, video and more into our customers' homes in real time," said Brennan Mullin, senior vice president of Sony Electronics' personal imaging and audio business. "By adding content from Netflix and Demand Media to our dash product, Sony is giving consumers a new, convenient way to enjoy some of the highest quality entertainment and most useful information available on the Internet today." Movies and TV episodes streamed instantly from Netflix can be easily accessed through a Queue-based user interface, in which choices from a Netflix member's Queue will be automatically displayed when the Netflix icon on the device is touched. From Demand Media, eHow is a leading how-to resource with a thriving online community dedicated to providing people with the ability to research, share and discuss solutions for life's everyday projects. eHow brings thousands of instructional, professional and high-definition videos to the dash platform. Designed to help golfers of all ages and skill levels improve their game, Golflink provides hundreds of its valuable instructional golf videos from world class coaches such as Hank Haney and Jim McLean as well as hole-by-hole golf course flyovers. LIVESTRONG.COM is a partnership between Demand Media and the Lance Armstrong Foundation (LAF), and is home to 2.1 million registered members who share a passion to lead a healthy, active lifestyle. The channel offers hundreds of videos from topics such as healthy food choices and treating injuries to instructional videos on sports and fitness. Sony's dash personal Internet viewer will be available this April for about $199 at www.sonystyle.com, Sony Style® retail stores and a variety of authorized dealers nationwide.